Cranberries are more than just a tasty addition to a healthy meal or snack. I love them whether I am drinking it up or blending them in smoothies. This “super fruit” is a native plant to North America and has been used for a variety of health problems like urinary disorders, diabetes, liver problems, and even stomach ailments. The fruit, juice, and even the oil have been used to heal and protect our bodies for hundreds of years and there is no need in sight for its use. The botanical name for this beloved fruit is Vaccinium macrocarpon and they are an excellent source of antioxidants like phenolic phytochemicals. These antioxidants may actually reduce the risk of cardiovascular disease and lower blood pressure. 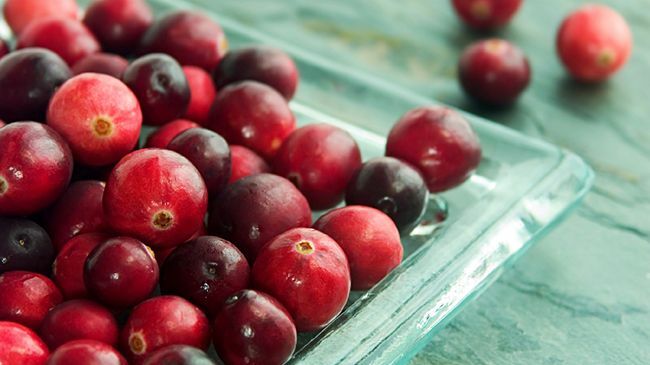 Cranberries are an excellent source of vitamin C, E, and K, along with fiber. According to the Department of Internal Medicine and Nutritional Sciences Program of the University of Kentucky, the high fiber will significantly lower risks for developing coronary heart disease, stroke, hypertension, diabetes, and obesity. The nutrients in cranberries actually soothe skin and the antioxidants fight disease. According to WebMD, this sweet and tart fruit nearly outranks every other fruit and veggie with the vitamins, fiber, and antioxidants. One cup of whole cranberries has 8.983 total antioxidant capacity with only 45 calories. So we know how great this fruit is for our bodies, but are you aware of how beneficial it is for our tresses? When it comes to our hair and our scalp cranberries are just as potent in a positive way. Most love the cranberry seed oil when wanting to use for the hair and scalp and for good reason. Cranberry seed oil is usually cold pressed and is truly an overall body and hair oil to try. Antioxidants – Antioxidants fight free radicals and repair cellular damage caused by pollutants. They include organic acids like benzoic acid that will enhance scalp circulation and help promote healthy hair growth. Because of this high contents of antioxidants and phytosterols, cranberries are an excellent addition to a natural sun protection for your scalp and hair. Fatty acids – Cranberry seed oil has powerful Omega-3 fatty acids. What’s so great about them? Well, Omega-3 acids help fight inflammation, which is great for scalp ailments, but they also nourish the hair follicles for stronger, shinier strands. Minerals – Yes, this amazing oil even has minerals that are treasures to your tresses. There is calcium, copper, iron, magnesium, manganese, phosphorus, potassium, selenium, sodium, and zinc. Of course drinking the juice daily would allow these amazing minerals to make their way to your tresses, but a better effect would be directly added to your hair through the oil where the nutritional benefit will be delivered right to the scalp and absorbed by the roots. Vitamins – the vitamin that you want for shine and strength is vitamin E and cranberry seed oil is loaded with it. Vitamins E and C help with sun protection but C also fights the bacteria on the scalp and wards off dandruff to free the scalp of debris and encourage hair to grow properly. It also helps with a dry itch scalp with its antiviral properties. Vitamin C helps to improve blood circulation, strengthens and repairs capillaries, so this makes for stronger and even thicker strands. After washing and conditioning but before styling, apply cranberry seed oil (lightly) to your scalp and massage until absorbed. Style as usual and this should help with any scalp issues you have. Once or twice a week apply cranberry seed oil (lightly) to scalp until absorbed at night. Pull hair up into a bun, cover before going to bed.